SoundStir, an Android app that lets users customize a feed of public radio stories and build communities around topics, took first place Wednesday in the eighth annual Reynolds Journalism Institute Student Competition sponsored by the Public Media Platform. The Public Media Platform is a digital content distribution system founded by NPR, PBS, Public Radio Exchange, Public Radio International and American Public Media. Students from the Missouri School of Journalism and the University of Missouri College of Engineering created teams and started working in the fall on developing prototypes of products and services that would use the PMP and expand public media’s audience. SoundStir’s potential to form communities around topics and its ability to collect metadata that can be used by public media providers to improve programming helped it edge out the competition. “These guys kicked it from the start to the end,” said PMP Executive Director Kristin Calhoun. 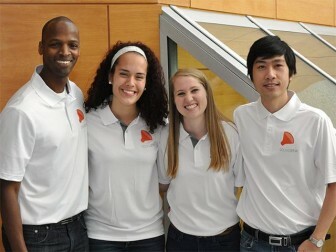 SoundStir was developed by journalism students Alix Carruth and Rachel Koehn, computer science master’s student Manav Singhal and computer science doctoral students Son Nguyen and Kristofferson Culmer. Judges also recognized the team behind Turnip, an app that matches public media stories from the PMP with trending Twitter topics. The team received a technical innovation award. Turnip was developed by journalism master’s degree students Tatiana Darie and Olga Dorovskykh, computer science doctoral student Mike Phinney, informatics doctoral student Sean Lander and Abhishek Shah, a computer science master’s degree student. 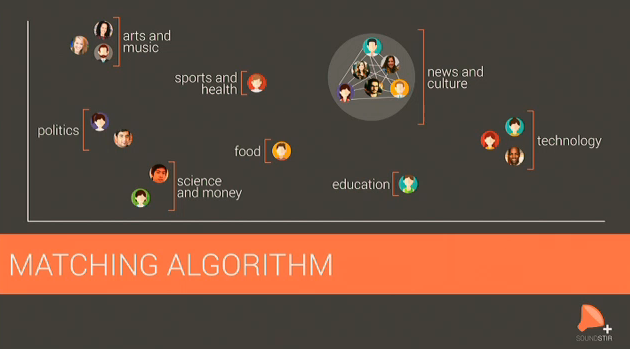 SoundStir uses an algorithm to match listeners’ preferences and form communities around topics. Two other teams were finalists. One created Team Delve, a Google Chrome plugin that lets users highlight content and match it with related PMP content. Clickable summaries of matches appear in a sidebar. The fourth finalist was Story Grove, an Android app that allows for public media content curation. The app creates a virtual backyard of content “trees” that can be shared with other app users. The SoundStir and Turnip teams won a trip to Washington, D.C., in May, where they will have the opportunity to pitch their products to a group of public media executives at NPR. All four teams also won their choice of an Apple Watch or Android smartwatch. Judges were Ann Alquist, membership director for Alaska Public Media; Shane Guiter, c.o.o. of KCPT in Kansas City, Mo. ; Cristina Hanson, deputy director of the Veterans Coming Home initiative at Wisconsin Public Television; Randy Picht, executive director of RJI; and Randy Smith, Reynolds Professor of Business Journalism at the Missouri School of Journalism. Next year’s competition will focus on wearable technologies like smartwatches, which the competition’s creators see as a potential game-changer for spawning new ecosystems of users and devices. The competition will launch in the fall. Executive Director Julie Drizin and Digital Editor Mike Janssen contributed to this article. DENVER — The Public Media Platform is moving into the next phase of its CPB grant, shifting its focus to developing a sustainable business plan and more ways for public media stations to access the content. PMP Executive Director Kristin Calhoun announced the project’s next phase July 9 during the “Digital Day” conference leading up to the Public Media Development and Marketing Conference in Denver.